Literacy week is an amazing opportunity to encourage children to find and fall in love with new and old stories. In October, the International Montessori School of Beijing (MSB) held their literacy week to celebrate children’s literature with plays and performances, storytelling, a Book Character’s Parade, class parties, author and journalist appearances, and other literary and literacy activities. I was invited to the school to watch a play based on Eileen Brown’s picture book Handa’s Surprise by the UK based Little Angel Theatre troupe on October 28. In attendance were over 70 preschoolers (who were adorably shy and whispering to each other about the set before the performance) seated on the floor along the four corners of where the stage had been set up. Handa’s Surprise tells the journey of Handa to her best friend Akeyo’s home in the next village that’s set in the south west of Kenya. The books introduce seven different fruits and animals that are commonly found in Africa. The fruits, gifts for her friend Akeyo, are eaten by seven animals while on her journey. 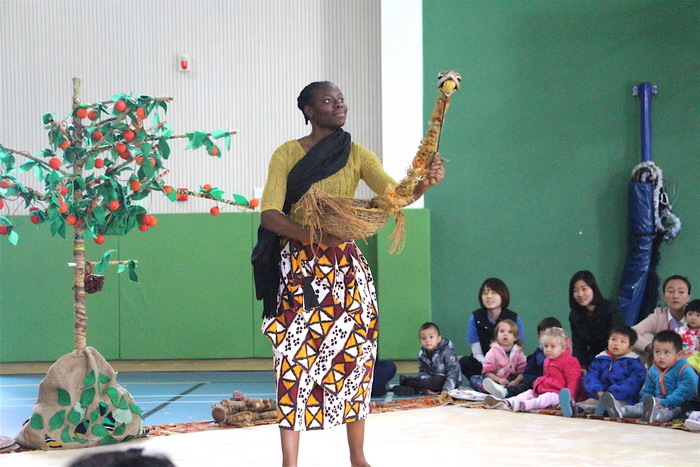 The performance was full of puppetry, songs, and dance that encouraged the children to join in by clapping, singing along, and interacting with the animal puppets. They all stood up to dance at the end of the performance. Leading up to the performance, the students had been well prepared by their teachers, having read the English and Chinese versions of the book in advance. The teachers have also integrated the story into their monthly themes of fruit and animals so the children easily recognized the fruits and animals featured in the narrative.